Endophytic fungi colonization is an eco-friendly strategy to respond to environmental stresses and confer tolerance to the host plant. Here, the responses of wheat plant inoculated with an indole acetic acid (IAA) -producing endophytic fungus to drought stress and water recovery were evaluated. The inoculation of wheat plants with Alternaria alternata (LQ1230) was conducted to evaluate drought resistance under adequate water, water deficit and water recovery conditions by examining the growth parameters and various physiological indicators of wheat seedlings. The LQ1230 isolated from Elymus dahuricus Turcz could secrete indole acetic acid (IAA) by both the tryptophan-dependent (319.24 ± 14.88 μg/mL) and independent (40.12 ± 8.59 μg/mL) pathways. LQ1230 inoculation enhanced wheat growth and drought tolerance through regulation of antioxidant enzyme activities and the content of compatible solutes such as soluble sugars and proline. Additionally, LQ1230 inoculated plants demonstrated significantly improved photosynthesis, C and N accumulation of wheat plants, leading to a positive relationship with plant dry biomass under water deficit and re-watering conditions. We found that the improved wheat plant growth, photosynthesis and nutrient accumulations by the inoculation of Alternaria alternata LQ1230 might be attributed to the reprogramming of wheat plant metabolism, thus enhancing wheat drought tolerance. Inoculation with fungal endophytes such as LQ1230 has the potential to increase crop drought resistance. Responsible Editor: Matthew G. Bakker. The online version of this article ( https://doi.org/10.1007/s11104-019-04028-7) contains supplementary material, which is available to authorized users. 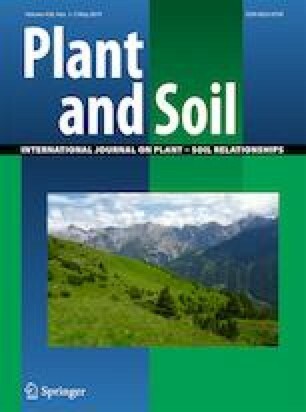 The authors would like to acknowledge the Institute of Grassland Research of CAAS for providing the Elymus dahuricus Turcz seeds and Xuan Xu for helpful comments and revision of the manuscript. This study was financially supported by the Science and Technology Innovation Project of Chinese Academy of Agricultural Sciences.